Kidney Pain Relief : Kidneys are one of the most important organs in the body, responsible for a wide range of functions and flushing out toxins and other waste from the products. However, like any other organs in the body, the kidney is also prone to infection for a number of reasons. This occurs more commonly in women. If you suffer from lower back pain, it may be due to an infection in your kidney. If you experience sharp and severe pain on one side of the buttock and lower rib, this may also indicate kidney pain. Often the formation of kidney stones also causes excruciating pain. Kidney stones, like you may already know, are hard crystalline mineral-like deposits that are formed within the kidneys or even urinary tract. The good news is that there are many natural remedies available to provide relief from both kidney pain and stones! 1. Lemon Juice – Lemon contains acetic acid that helps in breaking up and dissolving kidney stones. It removes stones and toxins, thus cleansing the kidney. This, in turn, relieves the pain associated to it. Squeeze the juice of one lemon. Add the juice to 1 glass of water and stir well. Mix 4 tablespoons of lemon juice and 4 tablespoons of olive oil. Drink the mixture every day to relieve kidney pain. 2. Parsley Tea – Parsley is known for its diuretic properties. It helps in increasing urine output which in turn flushes out harmful toxins from the system. It can be used to treat the pain with both internal and external use. It also has antiviral properties which eliminate the bacteria that cause infection in the body. Boil 4 cups of water over medium heat. Chop 1 bunch of parsley. Remove the water from the heat and add the chopped parsley. Cover and allow it to steep for 20 to 25 minutes. Strain the tea and drink (hot or cold). Drink this parsley tea 4 times a week for kidney pain relief. Note: Avoid drinking this tea during pregnancy. 3. Cabbage leaf Compress – The leaves of cabbage can come in handy in treating kidney pain. It has healing properties and helps alleviate pain naturally. Cabbage has been used since ages to treat myriad bladder problems too! Take a pot of water and put it to boil on a medium flame. Put a few leaves of cabbage, 3-4 slices of onion, and a handful of bran to the boiling water. Boil this for at least 20 minutes or until all the water has evaporated. Wrap the paste left behind in a clean gauze and apply the poultice to the area afflicted with pain. Reapply till the pain begins to subside. 4. Corn Silk Tea – This tea is known to soothe pain associated with the urinary tract and also speeds up the healing process of the kidneys. Studies have shown that corn silk has diuretic properties and also has the ability to inhibit the growth of certain bacteria. Corn silk tea is thus an effective natural remedy for kidney pain. Remove from heat and add to 1 tablespoon of dried corn silk. Cover and let it steep for 5 to 10 minutes and strain. Drink 2 to 4 cups of corn silk tea daily throughout the day. 5. Kidney Beans- Kidney beans is yet another potent remedy when it comes to the home treatment of kidney pain. These magical beans can help relieve pain caused by both kidney stones or a kidney infection. You will need to prepare and drink a concoction made of these beans to benefit from its medicinal properties. Separate the beans from its pods. Boil the pods on a low flame until they become soft and tender. Strain the water, and let it cool. Drink the mixture several times in a day for relief from excruciating kidney pain. 6. Watermelon Seed Tea – Due to its diuretic properties, watermelon seed tea has the ability to flush out and cleanse the kidney and bladder. It also helps in stimulating under-active kidneys. Harmful toxins and waste are effectively removed from the system. Take 1 tablespoon of cut or ground watermelon seeds in a container. Pour the hot water over the seeds. Cover and let it steep for about 5 minutes. Let it cool. Drink watermelon seed tea once every day at least 3 times a week. Must read : How To Relieve Lower Back Pain? 7. Olive oil (Virgin) – This is a remedy that is far from sweet, yet works like a charm! Although you will need to gulp down some olive oil, you will be glad you did. Mix equal parts of virgin olive oil and lemon juice. 8. Dandelion Tea – Dandelion too has diuretic properties, which means it effectively increases urine output. Therefore, it flushes toxins out of kidneys to remove stones as well as relieve pain. Apart from this, dandelion tea also helps in boosting blood circulation in the kidneys. Add the hot water to 1 to 2 teaspoons of dried dandelion leaves. Drink a cup of dandelion tea 2 to 3 times throughout the day. 9. Nettle Leaves- These leaves are really efficacious when it comes to treating ailments related to the kidney. It helps in the smoothing the flow of water through the kidneys and bladder. Oral consumption of these leaves also keeps bacterial infections at bay and hinders the stones from forming. Boil a handful of nettle leaves in a pot of water. Allow the mixture to cool let it steep for a few hours. Strain and drink the concoctions through the day. 10. Marshmallow Root – This is a medicinal herb that is used to treat a number of ailments, including kidney pain. Apart from relieving pain, marshmallow root also helps in the passing off kidney stones. It has diuretic properties which help in increasing urine output and curing burning sensation or pain. This root also has mucilage that protects and soothes irritated and inflamed tissues of the body. Mix 4 tablespoons of marshmallow root and slightly less than 1 liter of water in a jar. Cover the jar and let the ingredients infuse overnight, preferable in the refrigerator. If not overnight, make sure that it soaks for at least 4 to 5 hours. Strain the water the next day to get a thick, viscous, pale golden liquid. Drink this throughout the day. To improve the taste, you can add honey or stevia, depending on your preference. Place 1 tablespoon of marshmallow root in a pot. Pour 1 cup of hot water over it. Strain and drink. You can add honey or stevia to sweeten. Drink 2 to 4 cups of marshmallow root tea every day. Must read : How To Get Rid of Razor Burns? 11. Willow Bark – This herb has been used in Europe and China for centuries as a natural treatment for kidney pain. It has antioxidant, anti-inflammatory and antiseptic properties to help relieve kidney pain. It also has other immune-boosting properties that help improve kidney function. Boil 8 ounces of water with 1 to 2 teaspoons of dried willow bark. Simmer for 10 to 15 minutes, and then take it off the heat. Cover and steep for 30 to 45 minutes, and then strain. Drink 3 to 4 cups of the tea 3 to 4 times every day. Willow bark is also available in liquid and capsule form. Standard dosage is 60 to 240 mg.
You can also take it in tincture form – 4 to 6 ml. 3 times a day. Before starting this remedy, make sure that you are not allergic to willow bark. 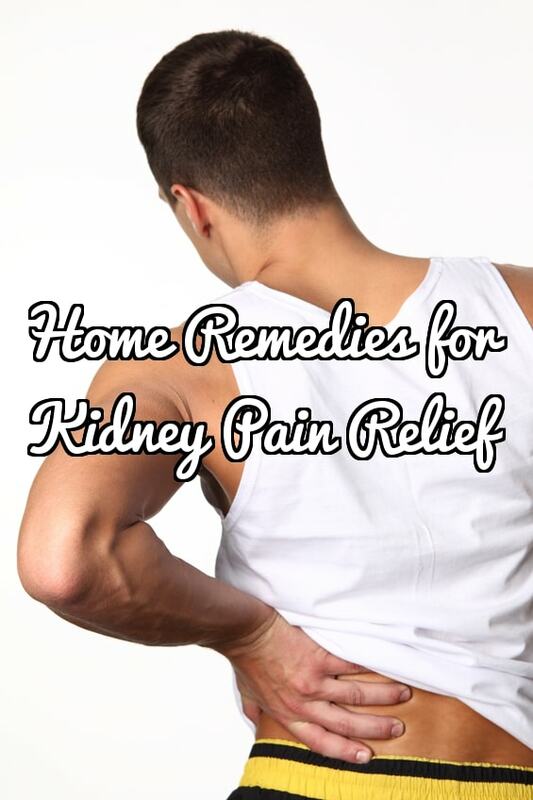 As you can see, there are many home remedies available for kidney pain relief. They are natural and safe, and best of all, highly effective in treating this problem. If you suffer from kidney pain, forget about conventional medications and opt for natural remedies instead. Thanks for sharing good information with us . Actually kidney pain is very dangerous pain. I think everyone remove this pain naturally by using your idea. Kidneys are one of the most important organs in the body. However, like any other organs in the body, the kidney is also prone to infection for a number of reasons. Ayurveda provides very effective Ayurvedic treatment through natural remedies for kidney diseases. How To Get Rid of Razor Burns? - How to Treat Razor Burn Fast at Home?